Chinese is a particularly significant language for New Zealand because of the economic and cultural ties this country is developing with the Chinese speaking world. The large and rapidly growing Chinese-speaking Pacific Rim populations, in particular, offer New Zealand considerable potential for tourism and trade. In the Year 9 course, students learn as beginners to communicate in Chinese in variety of everyday situations. Students are introduced to pinyin and Chinese character writing systems. They have the opportunity to access to a range of computer software and applications. By the end of six months, students will be able to talk about themselves, their family and pets. They are also able to do word processing in Chinese and use interactive language-building programmes. 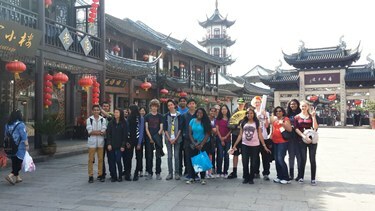 In the courses of Year 10 to 13, students’ Chinese language skills and cultural knowledge are gradually developed. Students become increasingly confident to take part in general conversation with native speakers, understand most of what is said, and contribute relevant comments. They can express and discuss many of their own ideas and opinions. They can read a variety of authentic materials and write expressively for a range of purposes. Students have the opportunity to take part in a range of Chinese cultural activities and a variety of language competitions, such as the Assessment of Language Competence, AucklandChinese speech Competition and Chinese Essay competition. Several exchange programmes and AFS Language Award for senior students who wish to put their Chinese language skills into practice in a Chinese speaking environment. Lynfield College has established a strong relationship with our Chinese sister schools in Hangzhou and Guangzhou. Several student groups have visited each other since 2006. It has effectively enhanced the cultural understanding and facilitated the language learning. Chinese is a very interesting subject to learn at Lynfield college; Not only are you learning a whole other language, but you also get to learn about the culture, food, history and about China’s important features. 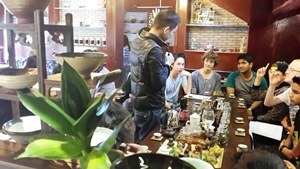 And if you are really lucky you can even get a chance to go to China and put some of what you have learnt to test. 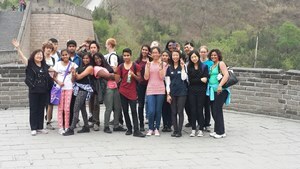 We were given the opportunity to go to China in term one this year along with a group of students ranging from Year 10 to Year 13, and it’s safe to say we all thoroughly enjoyed the experience. From landing in Shanghai International Airport to staying with home stays in Huangzhou Greentown School, and even getting to walk along the Great Wall in Beijing, we all fully immersed ourselves in the culture and heritage of China and it’s people. Armed with a limited Chinese vocabulary and a thirst for a bargain, we set upon the street vendors and markets throughout Shanghai, bargaining down prices with shop owners and explored the wonders of Nanjing Road. And if that didn’t test our Chinese knowledge, we got to stay with a Chinese student in Huangzhou for a week where they showed us the sights and sounds of their city. To top off the whole trip,we got to go to Beijing and visit the Giant Pandas, the Science Museum and the Great Wall among other things. We all left with many memories, photos and even a couple of new friends. For us, the trip was incredibly interesting and the once-in-a-lifetime adventure was very helpful for my studies in Chinese and I am richer for the experience. 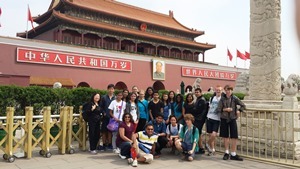 2014 - and another group of students enjoyed a trip to China. Photos below..